Before going to Miami last weekend for one of my close friend's bachelorette trips, I had a vision of what the city would look and feel like. I pictured sunny skies and beautiful women with surgically enhanced backsides in thong bikinis and Spring Breakers painting the town red with alcohol-fueled nights. The Miami I saw was more than bikinis and parties - it was full or art, of retro architecture, of hotels still standing strong and beautiful despite the damage the Hurricane caused. Miami is known to be a city of color and I couldn't help but notice how vibrant everything was. Flamingo pink sunsets, the fresh green of those fun and elegant palm trees, the electric neon signage and faded pastel store fronts that capture vintage Miami in all it's distinctive glory. I saw more families and couples on South Beach and talking to the locals they even said the demographics have been changing. The party element will sure always be there but now it's a bit more family friendly, a bit more tame. I fell in love with the vibrant, colorful city that speaks to people through fashion and art and local breweries and beachside restaurants where you eat tapas while your toes are in the sand, and rainbow colored diners with potted plants and tattooed waiters inside. Here are my three favorite places in Miami that I went to with the bride-to be Kate and her bridal party Nikki and Bethany. The Museum of Ice Cream in Miami has been on my instagram feed for what feels like forever and I can see why. Not only is it a blogger's paradise, but a great production with an enthusiastic staff. Each room has a theme and perfect photo shoot opportunities. Swinging banana chairs in a forest of pink palms, a retro pink diner serving up ice cream with a cherry on top, a tiny room you crawl into that looks like you are surrounded by bubble wrap. Each room was girly, delightful and breathtaking to see. I loved how fun it was and how the staff kept a perfect pace. It is an absolute must see! 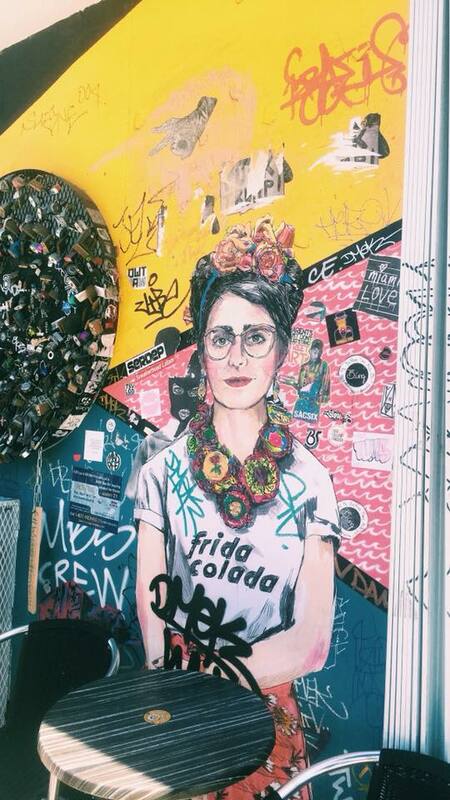 I absolutely loved the inspiring, colorful Wynwood Art District of Miami. It's amazing to see a once-struggling neighborhood become revitalized with art and city talent. Local breweries, vintage boutiques, cafes with gorgeous porches and the iconic Wynwood walls with the traveling street murals are all a vibrant slice of Miami. It's hard not to fall in love with the walls of gorgeous faces, geometric and eye-catching cityscapes, and unique takes on pop art. I really loved my brunch at Wynwood Diner. It's a rainbow dreamland on the outside and inside a retro diner with hipster, artistic sensibilities. We sat in a cozy booth and I ordered fluffy pancakes and had the tastiest mimosas. Inside I noticed how fashionable and stylish everyone was. The Wynwood walls brought out so many younger people in packs looking for the perfect Instagram shot. The Tavern is a full service bar and restaurant in Hotel Croydon right in mid-beach Miami. We had dinner and drinks there. I ordered the veggie panini and it was both light and fulfilling. Afterwards, Kate and I grabbed some drinks and went to the rooftop to overlook the sparkly Miami city scape. The wind was a bit cooler and we saw people hanging out, talking also enjoying the night. It was a gorgeous hotel with lots of art and character. My time in Miami was an inspiring, color story. I feel ready to write poems and take pictures full of sparkle and magic.